BRUSSELS/PARIS: In Tehran on Jan. 8 during a meeting with European envoys, Iranian officials abruptly stood up, walked out and slammed the door in an extraordinary break with protocol. The next day, the EU imposed its first sanctions on Iran since world powers agreed the 2015 Vienna nuclear arms control deal with Tehran. 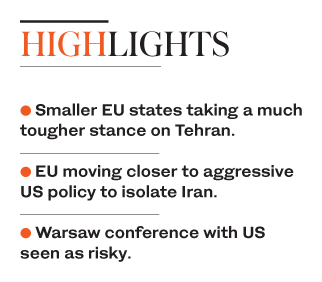 The new approach moves Europe closer to US President Donald Trump’s policy of isolating Iran with tough sanctions even though European governments still support the 2015 Vienna deal from, which he withdrew in May. Tehran denies the plots and says the missile tests are purely defensive. “The accusations against Iran over the past few months have awoken a few countries in Europe that were against a tougher line on Iran,” a European-based Middle East diplomat said. The EU is set to officially launch a mechanism, the special purpose vehicle (SPV) to trade with Iran later this month but it will not be operational for several months. It will be registered in France, run by a German and likely to include Britain as a shareholder.